A crowd of onlookers gathered in the Cornmarket to witness the annual switching-on ceremony of Louth's Christmas lights. People waited patiently in spite of the rain, which poured down throughout the ceremony. 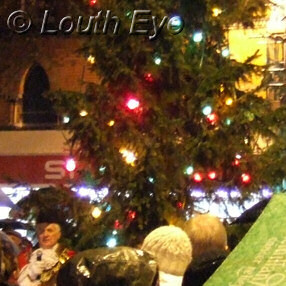 Local schoolchildren sang Christmas carols and a brass band also played. The Mayor of Louth, Councillor John McDonald, switched on the lights this year. 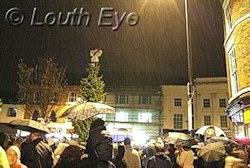 Fine weather encouraged crowds to come and soak up the party atmosphere of the annual Christmas Market on December 7th.